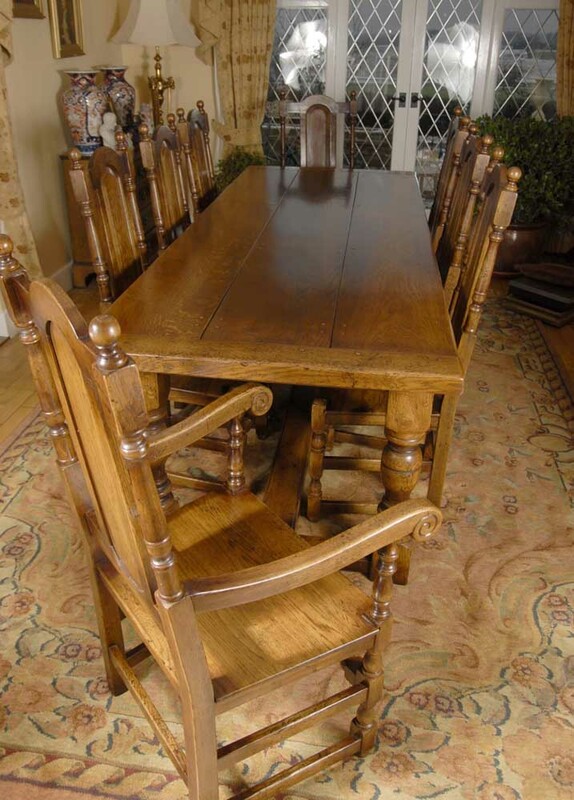 You are viewing a gorgeous dining table and chairs set that really is fit for a king. 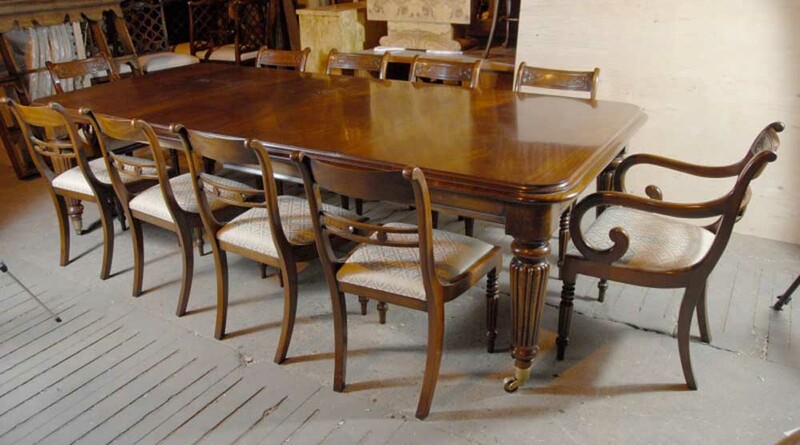 The table is an extendable Victorian mahogany diner table that’s an impressive 9 foot long when fully extended. Around the table are a sumptuous set of 10 Regency swag dining chairs also in mahogany – and I hope you agree how marvellous this set looks. The table has two leaves each measuring 24 inches each. This would make a great table for large scale dinner parties, and the table can be made smaller for different occasions. The table extends via the pull system so you can drop in the different leaves to serve your purposes (please see close up photos) that is very easy to use. Check out details like the bulbous hand turned legs on castors so it is easy to move aroud. The set of 10 chairs are hand carved from mahogany with gorgeous details in the Regency style including of course the distinctive swag back. The set consists of two carves and 8 side chairs. They are cushioned so comfy to sit in and have just been reupholstered so are free from any previous owners smells such as pets and smoke. They are solid and sturdy, like the table, wobble free and ready to serve you for generations of use. 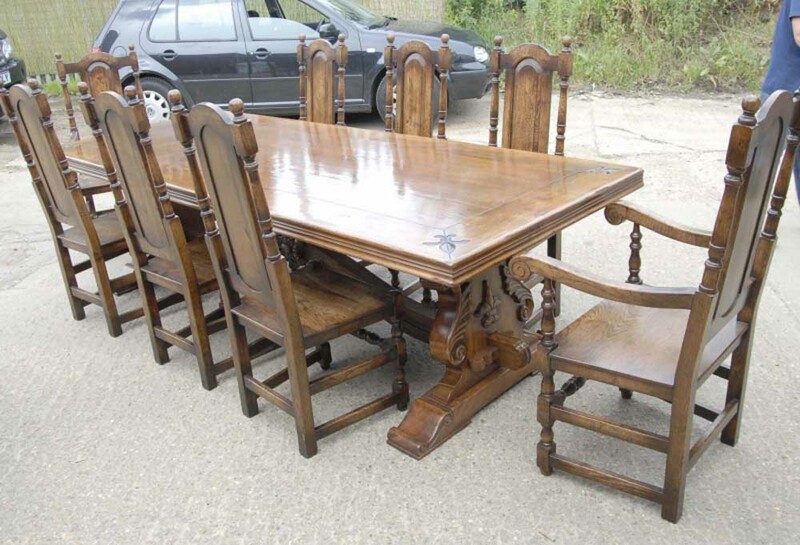 This really is a king like dining set – it is quite an outlay but it will last for ever and is hence a great heirloom. It is all hand crafted, the quality is superb, I hope the photos do it some justice, it is better in the flesh. We bought this set from a dealer in Sheringham, Norfolk and we will ship to anywhere in the world. 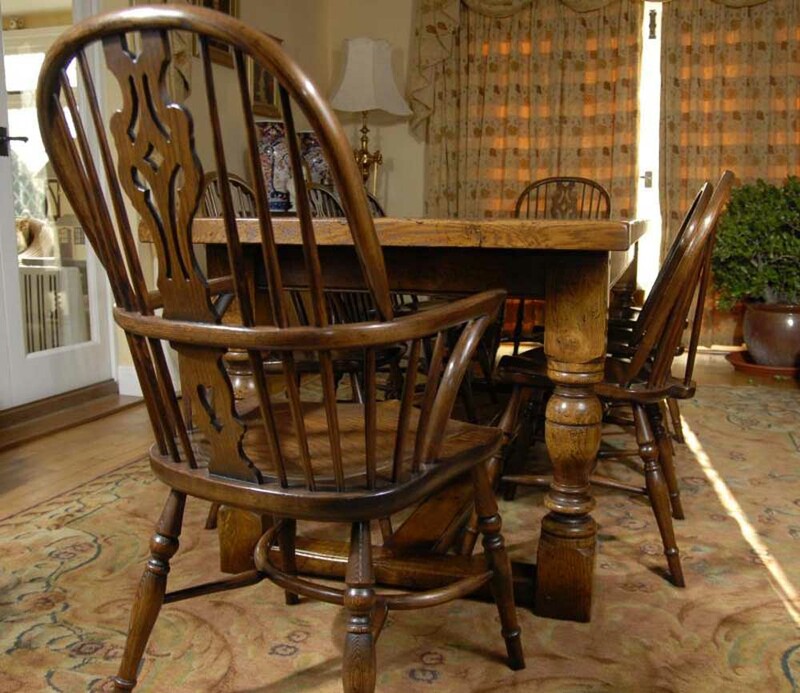 You are viewing a gorgeous dining table and chair set. 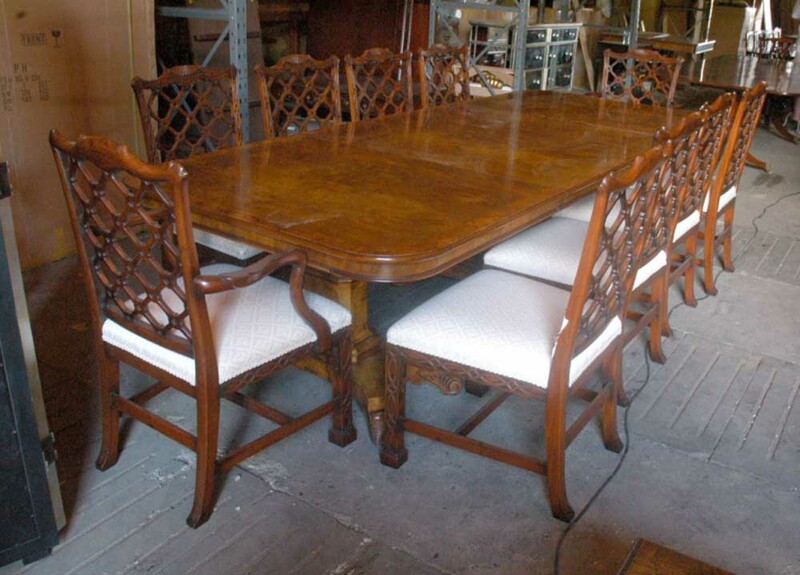 The chairs consist of 10 Chinese Chippendale diners with a Gothic backsplat, all hand carved from mahogany. There are two carves and 8 side chairs. 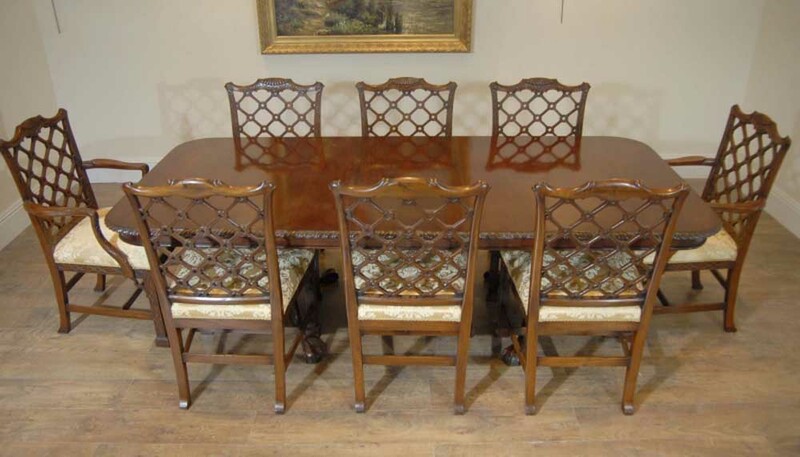 The dining table is a matching Regency pedestal table in walnut. We put these together as it makes for an absolutely knockout set – fit for a king and queen. It’s hard to know where to start when describing this wonderful set. For those of you looking to invest in some quality that will last for generations hence becoming an heirloom then look no further. The table is a Regency diner with pedstal legs on brass castors so you can move it around easily. The table works on a leaf system so you can take the leaves out to make it smaller to suit your dining needs. Fully extended the table sits ten people more than comfortably, so you can only imagine the dinner parties you can throw with this. It has one leaf 38 inches long so when this is removed the table measures 81 inches – smaller so you can keep it out of way except for occassions. 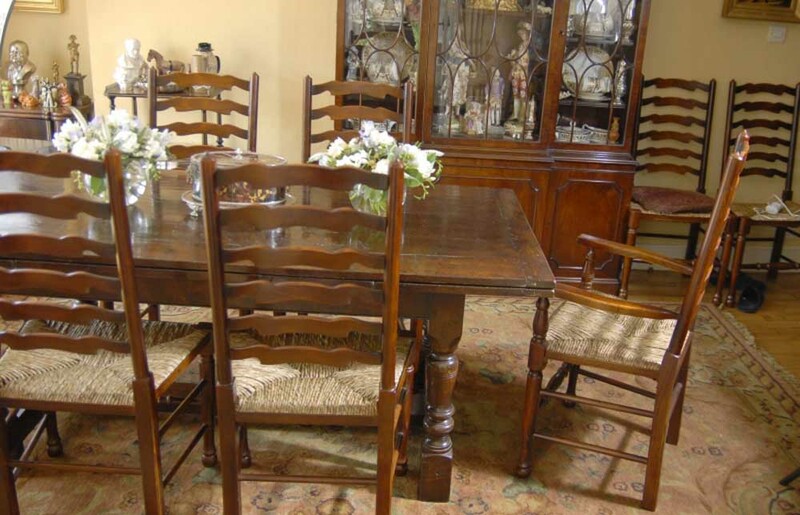 The chairs are also knockout – these really were a unique find at the dealers in Debenham, Suffolk. They have a lovely Gothic look with the hand carved backspat – there are further carved details on the legs and arm rests. You can only imagine the time to craft these and they are in the Chippendale manner, solid and chunky with no wobbles. Both table and chairs are offered in perfect condition ready for home use right away and we will ship to anywhere in the world. We will also sell the chairs or table separately if you are interested so please email for more details. Happy bidding, these won’t be hanging around for long.